Engaging local stakeholders to build local networks is one of the main goals of FOODBIZ – University and business learning for new employability paths in food and gastronomy, an Erasmus+ funded project involving four European universities committed to strengthen key employability skills of higher education students in the field of food and gastronomy. The project’s state of play was discussed during the third project meeting held at the University of Gothenburg (Sweden) on 15-16 January 2019. The meeting gathered representatives from the eight partners involved in the FOODBIZ consortium: the University of Macerata (Italy) as leading partner; the University of Gothenburg (Sweden); the Faculty of Tourism and Hospitality Management of the University of Rijeka (Croatia); Poznan University of Economics and Business (Poland); the Piceno Lab of the Mediterranean Diet (Italy); the Svinesund Committee (Sweden); the European Cultural Tourism Network (ECTN); and the International Institute of Gastronomy, Culture, Arts and Tourism (IGCAT), represented by Research Officer, Fabrizia Toccoli. Discussion focused on the activities carried out so far by each university to boost co-creation processes between students and businesses operating in the local food markets and identify crucial learning needs. Furthermore, partners shared views on how to capitalise on those activities’ outcomes in order to develop online learning resources addressing the diagnosed learning gaps. IGCAT will be in charge of drafting the FOODBIZ guidelines, thought to guide the implementation of the project in other communities in the future. The document will be presented together with the project’s results at FOODBIZ Final Conference, to be hosted by Poznan University of Economics and Business in October 2019. 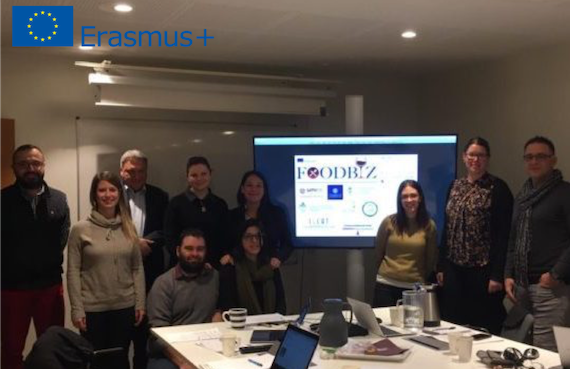 Developed in the framework of the action on Strategic Partnerships for Higher Education of the Erasmus+ programme, “FOODBIZ aims at promoting acquisition of relevant skills and competences related to employability in higher education students through their active involvement in community learning activities” as highlighted on the project’s website. IGCAT provides the Region of Gastronomy Award and is the official secretariat for the European Region of Gastronomy Platform. Furthermore, the Institute has developed the European Young Chef Award the Local Food Gift Challenge, the Top Food Experience and the Food Film Menu.